Art Collectors Retreat, Bellevue, Washington. Rerucha Studio. “Every site, every house has its strengths and weaknesses. The architect’s purpose is to see the essence of the home through the distraction of its present state. To help the home reveal its authentic self. In this home, the strength emanated from its original architect, Paul Kirk. Kirk was a founder of NW design: simple forms and details, regionally appropriate materials and a wash of Japanese serenity. Much of this composure was lost in ensuing decades of trendy remodels. There was a period weakness in the original design’s front elevation; the house sat as a blank wall on the street, without windows or architectural features and an entry through the carport. The design team chose to enter the mindset of Paul Kirk, honoring him and the art collectors who owned the potential of this home. The solution for the walled street-side and carport was to relocate the front door and accentuate the strong horizontal in new entry windows and glass garage doors. An entry sequence for the home was then created by elevating and stepping the landscape and dramatizing the hand-crafted steel door. 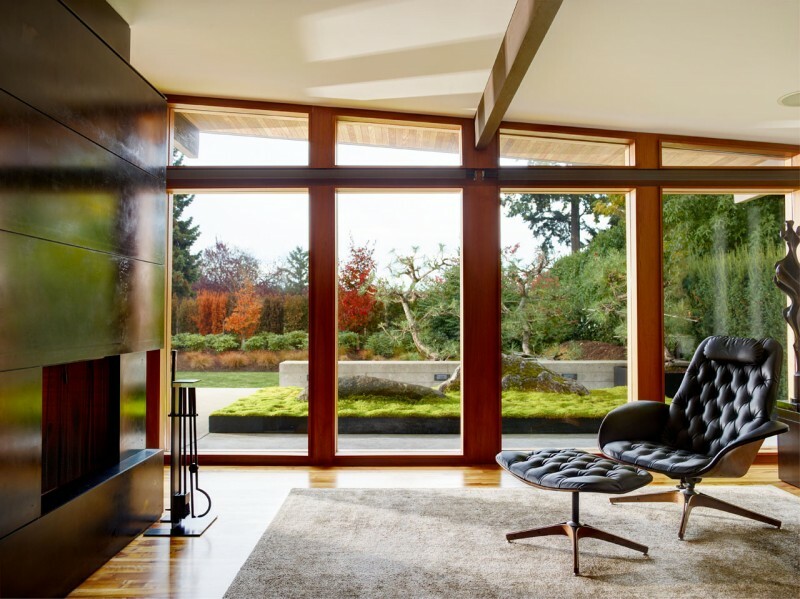 The strength of the home was its east wall of glass, but this dramatic feature emptied onto a paver patio and the windows had become secondary to added interior walls. Those walls were knocked down and the house gutted to bring in the flow of natural light. The serenity of the interiors was reflected by adding Japanese gardens with their timeless elements of pine, stone and moss; inviting the same contemplation as the art within. The inside/outside connection was strengthened, making the house expansive even with its small footprint. Every element; the materials, the sculpted landscape, the light, became part of the architectural composition, supporting and becoming, art.